Selling your home during the winter can seem challenging. Cold, wet weather and the busy holiday season add a few extra hurdles for homeowners to overcome. It takes a bit more work to show your home off to potential buyers and impress them with its beauty and comfort. Keep these simple tips and tricks in mind when staging your home in the winter. Believe it or not, curb appeal is just as important during the winter months as it is when the weather outside is not frightful. When potential buyers drive up to your home, you want to wow them with a great first impression. Maintain your landscaping, keep your property neat and clean, and shovel walkways and the driveway so they are free of snow and ice. Seasonal plants can be added to a porch or front steps as well. Small potted evergreens and pines make a beautiful touch in the winter when colorful flowers aren’t an option. If you have shrubs, trees, or bushes planted out front, be sure keep them well-pruned. A warm temperature indoors is essential to creating a cozy, comfortable atmosphere. It also helps to keep people inside longer, meaning potential buyers may linger more than usual. Turn up the thermostat a few degrees warmer than you normally keep it. If your home has a fireplace, considering lighting it before a showing. 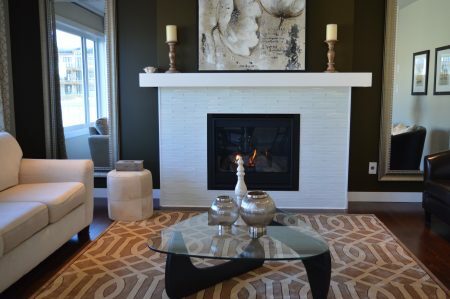 Not only is a fireplace a desirable feature to many buyers, but it also provides warmth and adds to the ambiance. Good lighting is important when showing your home in any season, but it’s especially important during the winter. This is because natural light can be harder to come by since daylight hours are shorter and the skies can be cloudier. Before a showing, go through every room and open the blinds and curtains. Turn on lamps and lights in all areas, from the basement to closets to the pantry. The more well-lit the spaces are, the bigger and brighter they’ll appear. Deep clean your home so every nook and cranny sparkles and shines. Scrub bathrooms, clean windows, make all of the beds, and organize the entryway to keep winter coats and wet shoes neat and tidy. A clean interior will be more attractive and give your home a fresh look. If you’re putting your home on the market during the holiday season, you’ll probably want to add some festive decor to enjoy in the meantime. Choose elegant, simple decorations that won’t clutter surfaces or walls. Add a wreath to your front door to make an inviting and welcoming first-impression for visitors. Most importantly, don’t let the winter weather keep you from listing and selling your home. By paying attention to curb appeal, making your home cozy, and keeping it clean, you’ll be able to showcase the best parts of your property for potential buyers. If you’re interested in listing your home or buying one, contact us today to get started! © 2019 Columbus Board of Realtors MLS, Inc. All rights reserved. IDX information deemed reliable but not guaranteed. Data last updated 2019-04-19T22:51:23.233.